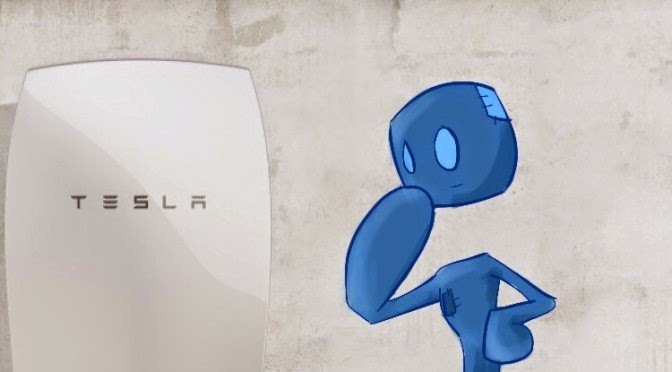 It comes as no surprise that the internet is abuzz with discussion, debate, and enthusiasm for Elon Musk and Tesla Corp’s big announcement yesterday – the Powerwall: A large lithium-ion battery that hooks up to your houses power supply (and a whole bunch of solar panels, if you like), allowing people everywhere to genuinely move ‘off the grid’ – as it were… Or at the very least, partially off the grid (depending on how you do it). For those who install the Powerwall without any solar panels, it would primarily be for alleviating your electricity bill during peak hours when more electricity is usually used by average people in the 9-5 business world. Now, for those who are a little more daring, this large battery (or two) might just be the solution to a whole lot of problems that have been keeping solar energy from really sweeping across the globe. ‘More trouble than the time it was worth‘ was the general consensus, we didn’t feel like we had the time to learn how to do it ourselves, and we weren’t willing to shell out some ungodly sum of money in order hire someone – especially since it never guaranteed actually even being ‘off the grid’ in the first place. And wasn’t that the whole point? But now, with the announcement of Tesla’s Powerwall, that large problem that I (and I’m sure many others) have faced is no longer the same issue it was before. Elon Musk and the team has put together a single wall-mounted battery bank in a small, compact shell that not only looks great, but has a 10 year guaranteed lifespan and has the potential to truly change energy usage and generation in the world. Perhaps even more exciting than that, its modular, so you could hook up 3 of them and run a small office building, or maybe even something a bit bigger! Now the only question, will the Powerwall hold up as a saving grace for energy efficiency as it is released to the world? Will the technology take, and grow popular at the helm of a massive shift in our energy technology? The Powerwall is the first of its kind. And as with all new technology, it will need the support of people to survive. Considering that you are a person, you too play a role in supporting it. The only way to know for sure… Is to wait and see how this technology is truly utilized. It’s up to all of our collective actions that will lead us in the direction that we go. what do you think? Will this be the precursor to the next generation of sustainable energy? Share your thoughts in the comments below, and lets talk about it! I would like to conclude this article with a personal thank you to Elon Musk and everyone who has been supporting him and working on all of these projects. The Powerwall in specific has the potential to do some really good good in the world, and its clear to see that Elon’s intentions are nothing but genuine. Thank you my friend, you are building us a better world.